Double LP version. Three-sided with etching on fourth side. Cameron Stallones, aka Sun Araw, is the quintessential contemporary cosmic courier. Emerging from the fumes of an ancient Egyptian civilization and now settled in one of the meccas of the American lysergic experience, Austin, Texas, he boasts an endless discography and collaborations with luminaries of the caliber of Laraaji (a solo new age traveler discovered by Brian Eno) and the legendary Rastafarian group, Congos. For the soundtrack of the feature film Guarda In Alto (2017), directed by Fulvio Risuleo -- the daring story of a baker who has access to a parallel universe on the roofs of the city -- Sun Araw looks towards the possible horizons. Bypassing psych and electronic glitch, Sun Araw jets through a double album that seems to refer to the golden age of computer music as well as to the inventions of the Lovely Music roster -- the legendary New York label specializing in minimalism and 20th century avant-garde -- and to a certain immeasurably psychotic dub aesthetic. A disk composed of many micro-cells, which marries the adventure to the "edge of heaven" of the protagonist, reiterating that dreamy feeling that the protagonist has accustomed us to for several years now. Cameron Stallones, aka Sun Araw, is the quintessential contemporary cosmic courier. Emerging from the fumes of an ancient Egyptian civilization and now settled in one of the meccas of the American lysergic experience, Austin, Texas, he boasts an endless discography and collaborations with luminaries of the caliber of Laraaji (a solo new age traveler discovered by Brian Eno) and the legendary Rastafarian group, Congos. For the soundtrack of the feature film Guarda In Alto (2017), directed by Fulvio Risuleo -- the daring story of a baker who has access to a parallel universe on the roofs of the city -- Sun Araw looks towards the possible horizons. 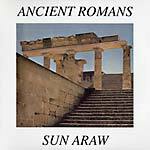 Bypassing psych and electronic glitch, Sun Araw jets through a double album that seems to refer to the golden age of computer music as well as to the inventions of the Lovely Music roster -- the legendary New York label specializing in minimalism and 20th century avant-garde -- and to a certain immeasurably psychotic dub aesthetic. A disk composed of many micro-cells, which marries the adventure to the "edge of heaven" of the protagonist, reiterating that dreamy feeling that the protagonist has accustomed us to for several years now. "B E L O M A N C I E is the 7th full length album from Sun Araw. 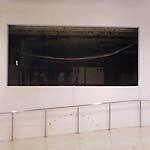 B E L O M A N C I E is a series of corridors that lead to specific chambers. B E L O M A N C I E is designed to be an active listening experience. B E L O M A N C I E is not designed to accompany existing environments, B E L O M A N C I E is designed as a transportation system. It is recommended to give B E L O M A N C I E your full attention, and to listen at the highest volume that is comfortable on high quality speakers with a pronounced stereo field or on an excellent pair of headphones. Interference is physicality. When faced squarely, each chamber produces a particular physical effect capable of causing a simple thing: an experience of discontinuity. Hot Jobs!" "On Patrol, originally released in 2010, is a double album in two parts, and the fourth full length album from Sun Araw. An album for heavy-steamin' late nights in the city, inter-dimensional back alleys, ghost cabs; it creeps and tunes in on a much darker, sparser, and more classically minded channel than its predecessors: dark and deep steam-vent ruminations on Phil Cohran, lenticular objects, and fried Hot 92.3 R&B slow-jams. A cold bug makes a real 'live wire.'" 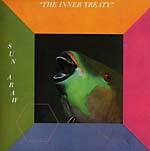 The 6th album by Sun Araw is The Inner Treaty. "Heartfelt and marbled, this album is documentation of the slow exit (the triumphal entry): moving the camera back 8 stages along the circumference of the circle to the point where the obverse is reverse, in order to celebrate the building of an edifice and then walk away from it in wisdom, gaining freedom from it." 2010 repress. One of The Wire's top albums of 2009. LP version, with full color glossy insert. "Long Beach psych-journeyman Cameron Stallones follows up last year's Beach Head LP with a whole new universe of Sun Araw action. Heavy Deeds finds him ditching the coast and roaming inland. The grooves are hairier, heatstroked, howling. Still soaked in wah and farfisa mirage but closer in spirit to some of the wild electricity stomps of The Phynx. 5 tracks, all hits. Mastered by James Plotkin."